Last week in The Lo-Down we went deep on Nebraska’s two primary defensive alignments, which are determined in part by what sort of block the Huskers are planning to put up. Today we will drill down on the block itself, how it’s taught, how it’s executed and why it’s called. Blocking is another skill that Nebraska works on each day. The Huskers will spend at least 15 or 20 minutes on blocking-specific drills each practice and also incorporate it into some of their six-on-six drills. Players are taught to “reach over and grab the attacker’s ears” when blocking. It’s certainly an easy visual to remember, and when executed it should give the hitter the fewest option for her attack. There are two basic blocking methods in volleyball, swing blocking and stand-and-block. Swing blocking is becoming more common in college volleyball. Most Division I teams use it at this point as it offers some clear advantages but requires pretty good timing. In a swing block the blocker is turning her body in the direction she wants to go and throwing both hands back. As she begins to move forward she will swing her arms upward generating momentum towards the block. The benefits of the swing approach are that it allows the blockers to get up a little higher than they normally would, a big advantage for smaller players, and it’s also a quicker block so it can help defend against offenses that like to run a higher tempo attack. It does, however, require intricate footwork and timing as it can sometimes be tough to get two blockers side by side given all of the movement required. Nebraska switched over to swing blocking within the past 10 years and was one of the first teams, along with some schools on the West Coast, to make the change. Stand-and-block is still in the mix at Nebraska, however. In this technique the blocker is stationary in front of the attacker and will do a mini-squat to propel herself upward. How high she can get is based solely on her vertical, so it can be harder for a smaller player to get as high as she would on a swing block. But the stand-and-block can make it easier for two blockers to connect and get up at the same time as the movement is minimal. You will see teams use stand-and-block most often when a team is out of system. In those scenarios, the set is usually high and that allows the defense plenty of time to get in front of the attack and time its jump. No matter the method, there are a few things all blockers are taught. Once they have put themselves in a position to “grab the ears,” they want to keep their palms facing the court in hopes of keeping the ball inbounds no matter where the hitter tries to put it. If the blockers aren’t able to stuff the ball the goal is to at least get a positive touch that results in a playable ball for the defenders behind them. It’s also always better to be late rather than early on a block. If a blocker is late she should be getting a touch on her way up. If she’s early she won’t be getting much of a touch on her way down. 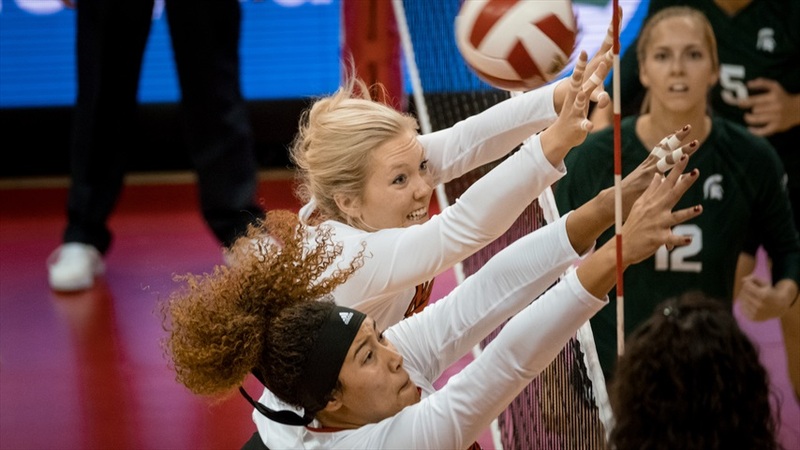 Lauren Stivrins (top) and Jazz Sweet combine on a block during Nebraska's 3-1 win over Michigan State on Oct. 4. Here are a few of the specific blocking calls Nebraska uses in a match. These are signaled in pre-serve using hand signals by one of the coaches. For the Huskers that coach is Tyler Hildebrand. The defense is working around those calls so once a block is signaled in, the team usually sticks with it. 7/8/9: These are the block calls for balls set to the outside. A 7 is used for a ball that’s one or two feet inside the pin, 8 is used against a perfect set right at the pin and 9 is used against a wide set (a couple of inches outside of the pin). 15/51: These calls are based on the offense’s tendencies. 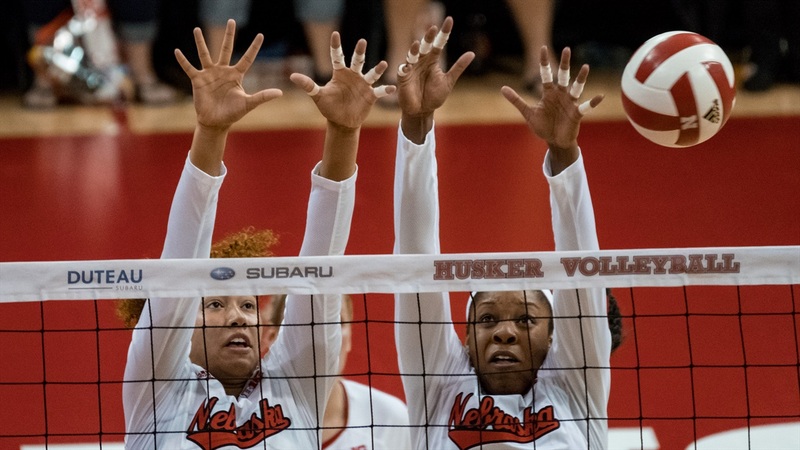 If a team likes to go to its right side, Nebraska might call 15, which asks the middle blocker to shade towards that side of the court (her left) and get in on the block more quickly. If the middle blocker shades right, it will be a 51 call and the offense is expected to be going to the left. Read Block: This is when the middle blocker attempts to read where the setter is setting the ball and goes in that direction. Commit Block: This is when a blocker commits to blocking a specific hitter. If an offense has a go-to attacker on the outside, the Huskers’ outside on that side and the middle will “commit” to her. It essentially means Nebraska will have two blockers up any time the ball is set to that attacker. The Huskers can also have a commit on a middle hitter. So how does it all come together? Here’s an example. Say Nebraska is playing Penn State. Penn State sets its middle hitters on a good pass. If Penn State has a good pass then the Huskers’ middle blocker is committing. She will show that by holding a fist behind her back. If Penn State is out of system, then it likes to go to its outside pin hitter. That is shown by a gun sign behind the middle blockers back. She will flash between commit and 51 (the gun sign) to show what she could be doing. Since Penn State sets its pin hitters all the way to the antenna, the pin blockers for Nebraska will be in an 8 set up. The defense will be in a White alignment behind it since there could be a chance only one blocker will be up with each hitter at any given point due to the commit. Want more of The Lo-Down? Find all of Lauren's previous columns here.